Workshop: "Geometric and Topological Approaches to Data Analysis"
To be held during the period Oct. 8-12, 2007 at the Quadrangle Club, University of Chicago. The University of Chicago and the Toyota Technological Institute are sponsoring a workshop on geometry and data, October 8-12, 2007. 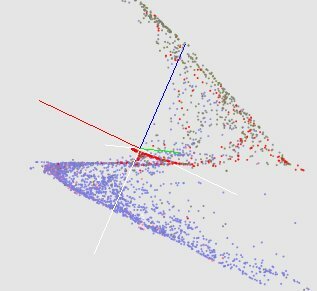 The goal is to get together mathematicians, statisticians, and computer scientists thinking about data analysis, related algorithms and their analysis, and applications, with an emphasis on a geometric or topological point of view. The analysis of geometry and topology of data has two inspirations. One is to find from a vast and unorganized set of data, especially in high dimensions, some kind of intrinsic pattern that could make that data more useful for applications in machine learning, data mining, or scientific analysis more generally. On the other hand, from computational geometry, one has motivation to represent geometric objects such as surfaces in efficient and accurate ways with a finite set of points. These two points of view with their associated algorithmic, statistical, and mathematical aspects will meet in this workshop. Organized by Partha Niyogi (niyogi@cs.uchicago.edu) and Steve Smale (smale@tti-c.org). Please address questions to Nita Yack (nitayack@cs.uchicago.edu).